Orlando Moving Company | Go Moving | Click Or Call Us Today. Orlando Moving Company Convenient 24/7/365 Quick Quote form. We’ll have your moving quote back fast. Get a handle on your move now! We do residential moving your way! From your entire home to selected rooms. We take the stress out of your moving day. From moving your office or heavy equipment to getting your employees relocated with ease, we make it our business to move your business. Get the manpower and muscle you need. Home staging, load & unload, large items like Pianos & Jacuzzi’s. We have your back! Orlando Moving Company You Can Trust. At Go Moving, our reputation is built on reliable service at a reasonable price! Locally owned and operated, our Moving Company has safely and successfully moved families and businesses for over two decades. Whether your move is across state lines or across the street, Go Moving is your no hassle moving solution! We move everything everywhere! Our offices are based in Central Florida, in addition our moving services are available nationwide. Residential & Commercial. Short or Long Distance, Relocation, Downsizing, Clean Outs and complete Pack and Move Service. 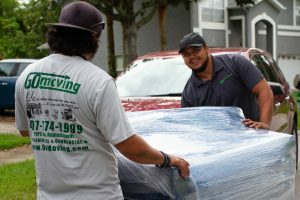 Click or Call Go Moving Orlando is unlike others in the moving industry, we give our customers the option of a flat rate move price by the item instead of by the hour. This enables us to guarantee an exact price for your move over the phone and it gives you price, flexibility and control of your moving budget. Don’t want to give your inventory? No Problem! Here at Go Moving Orlando we also have very competitive hourly rates with a guarantee to meet or beat any other moving companies price! Go Moving Orlando, we move everything! everywhere! Been using Go Moving for over 20 years. Never a problem and the rates are reasonable.